Germany-based TADF developer CYNORA, organizers of the First edition of the International TADF Symposium, was kind enough to offer a special 15% registration discount to OLED-Info readers . 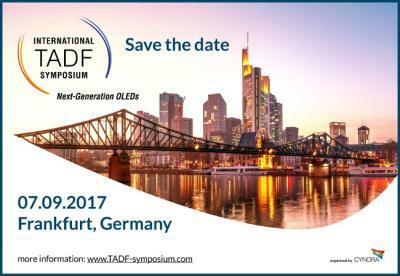 The TADF Symposium aims to provide a professional forum for industry and academia experts, with a focus on TADF OLED materials R&D. Several lectures will discuss issues ranging from modeling through synthesis to analytics and device fabrication. The event will feature speakers from LG Display, Samsung Display, Sungkyunkwan University, TU Dresden, Durham University and more - and will take place on September 7, 2017 in Frankfurt, Germany. TADF is considered a very promising path towards metal-free efficient OLED emitters. Several companies are developing TADF based materials - most notably Cynora and Kyulux which was spun-off from the Kyushu University in Japan. You can read more about Kyushu's TADF emitters here, and we also host an OLED Auditorium presentation from Kyushu's Prof. Adachi here. Cynora estimates that its blue TADF emitters will be ready for commercial use by the end of 2017. In March 2015 the European Commission launched a new project called Phebe that aims to develop and commercialize TADF emitters. Read our premium article discussing the latest advances in TADF emitters here.